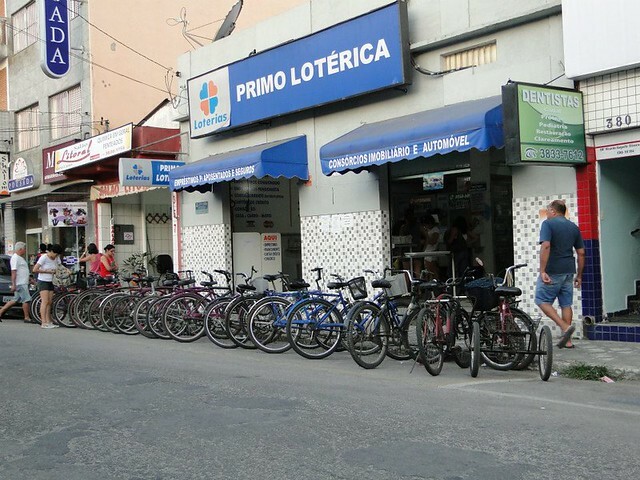 Update: 26 November 2013: New photos of Ubatuba bicycle parking added! Scroll down. 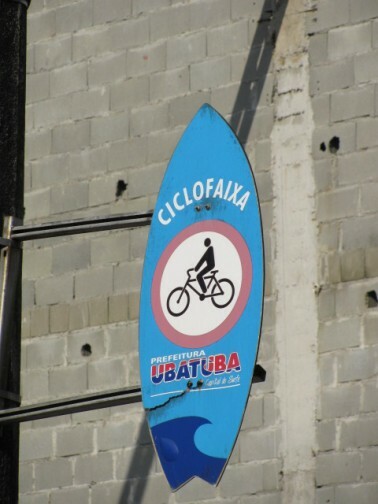 Denir, from the Books & Bicycles blog in Brazil sent us these shots from his holiday to the Brazilian town of Ubatuba. It's a surfing mecca and is even nicknamed 'Capital do Surf' so signage in the town is often surf-related. 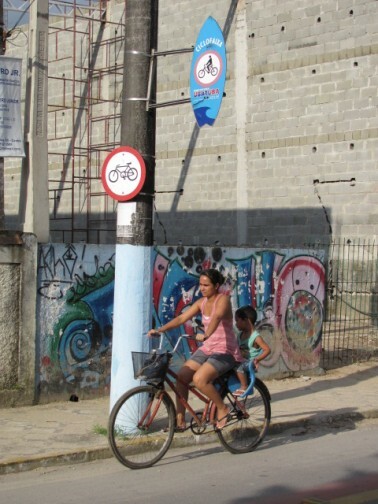 Which also applies to the 'ciclofaixa' or bicycle lanes in the incredibly bicycle-friendly city. Painted lanes, sure, by they are nice and wide - see the red/yellow markings at bottom right in the first shot. Having realised I'd stumbled upon a potential holiday paradise, I did a spot of googling. The name Ubatuba alone just sounds like a surfer paradise and could be worked into 50 different Beach Boy songs. 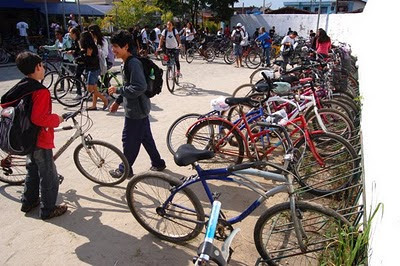 I found this article, in Portugese, about the city wherein it says that 80% of the students of this school ride bicycles to school each day. Impressive. And staying at a little pousada like this one is about €70 a night - about the same as a crappy, two-star tourist hotel in Copenhagen. Nice. 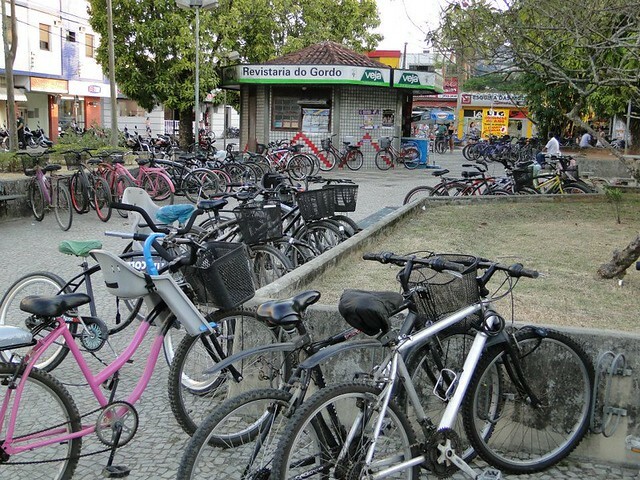 Some recent photos from Zé from Transporte Ativo, the Brazilian mobility NGO, showing bicycle parking in Ubatuba. What we need is a list of bicycle-friendly destinations to visit. Ubatuba, Barcelona, Seville, Ferrara, Bordeaux, San Sebastian, various Scandinavian/Dutch/German cities, etc. Preferably places uninfected by the Culture of Fear. Signage influenced by local branding is great, too. There are often rigid design manuals to be adhered to, which is fair enough, but being able to tweak the rules a bit would offer up some interesting signage. The Dutch, for example, could just hang Gouda cheeses up from signposts with a bicycle pictogram carved through. It would go well with their tulip island visible from space.